Shia Safavids Treasure Video Slot Review - Casino Answers! Shia Safavids Treasure is a 5-reel, 20-line video slot developed by Top Game, featuring a wild symbol, a free spins feature and a bonus game. You can play the Shia Safavids Treasure video slot at Bovada. The Shia Safavids Treasure casino game is a penny slot, with bets including $0.01, $0.05, $0.10, $0.25, $0.50, $1, $3 and $5 per line. 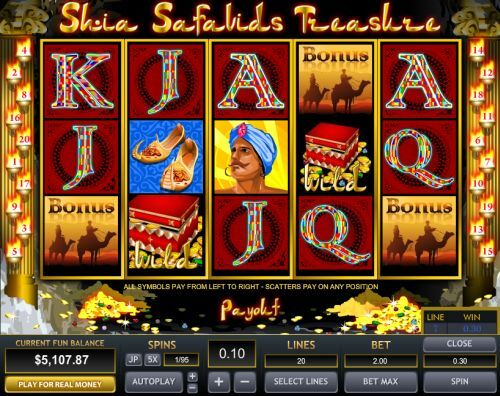 You can select up to 20 paylines on the Shia Safavids Treasure slot machine. 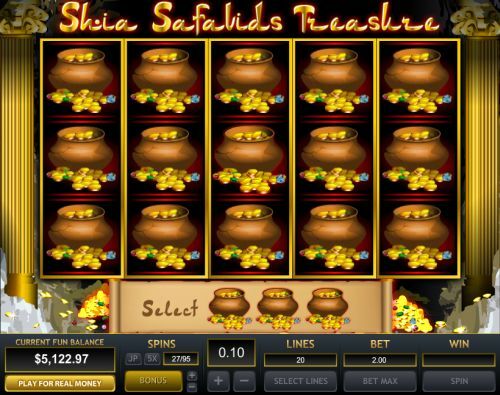 You can bet up to a $100 maximum total bet, giving Shia Safavids Treasure a good betting range. You can play the Shia Safavids Treasure video slot, select your bet and press the “Spin” or “Bet Max” buttons. The Woman is the highest paying symbol on the Shia Safavids Treasure online slot. If you land 5 Woman symbols on a selected payline, you will win the 2500 coin top jackpot. The Man is the second highest paying symbol, which can pay out up to 1000 coins. The Treasure Chest symbol is wild and will substitute for all other symbols except for the scatter and bonus symbols. You can use the Treasure Chest symbol to make more winning combinations on the Shia Safavids Treasure video slot at Bovada. The Oil Lamp symbol is the scatter symbol on the Shia Safavids Treasure slot game. If you land 3, 4 or 5 Scattered Oil Lamp symbols, you will win 5, 10 or 20 free spins. The free spins feature and bonus game can be won at the same time. Payouts are displayed on the Paytable. All symbols pay left to right, except for scatters (which pay on any position). Payline wins are multiplied by the bet per line. The Shia Safavids Treasure slot machine has a basic autoplay mode. Press the “Auto Play” button to access the autoplay controls. You can use the “+” and “-” buttons to select anywhere from 5 to 95 autoplay spins (in increments of 5). Press the “Autoplay” button to begin the autoplay mode. Choosing the autoplay feature will automatically play the games consecutively using the selected bet and line amounts. To stop the autoplay mode at any time, press the “Stop” button. The Shia Safavids Treasure video slot is a solid release from Top Game. It has a bonus game and a free spins feature as its highlights. Lowlights are a lack of scatter payouts and there is no free spins multiplier. Luckily, the bonus game is easier to trigger than many other Top Game video slots. You can play the Shia Safavids Treasure online slot for real money when you sign up and make a deposit at Bovada! Can players from the United States play the Shia Safavids Treasure video slot for real money? Yes, USA players can play the Shia Safavids Treasure slot machine for real money. You can play the Shia Safavids Treasure online slot at Top Game online casinos like Bovada. Can I play a free flash game of Shia Safavids Treasure in my web browser? To play the Shia Safavids video slot, you must download the casino software at Bovada.